(pattern discussion from The Quilt Index) Corn and Beans is the title of a.... "quilt pattern published by the Ladies Art Company. The Ladies Art Company placed small ads in ladies magazines and farm papers for their catalog. From the catalog, the pattern was ordered and mailed to the customer. 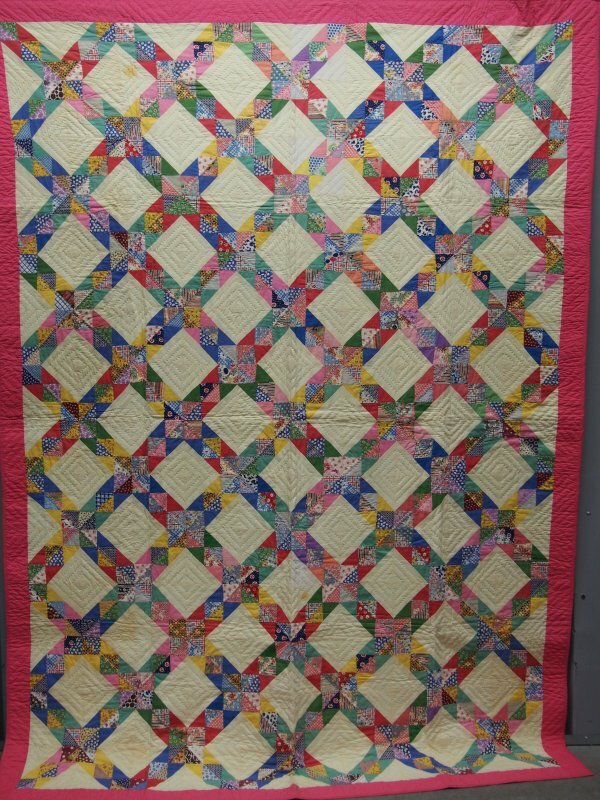 The LAC was the first business to offer hundreds of quilt patterns in a mail order catalog. Up until the 1950s the patterns consisted of a 3” pattern card featuring a color suggestion for the quilt block, and an envelope containing full size, tan tissue paper templates (without seam allowance or any markings) of each shape needed to complete the block. (The earliest versions of the 3" pattern cards were hand painted with water colors by the owner's children.) In the 1950s, the company changed hands and they started producing mimeographed sheets that included fabric yardage, labeled templates with seam allowances and line drawings of a portion of a completed quilt or the full completed quilt and also revised and reprinted the 1928 catalog. The earliest appearance of this pattern would have been the 1895 catalog. This is a quilt pattern in three pieces. A. An 8 1/2" x 11" sheet of paper with a black and white illustration of a partial quilt. Color suggestions and cutting instructions are included on the back. B. Stapled to the first sheet is an 8 1/2" x 14" page with a block diagram and full size pattern pieces (including 1/4" seam allowances). C. A small 3 1/2" X 3 1/2" square of cardstock with a drawing of the quilt block colored in tan and white. Quilt size: 84x97" Block size: 13x13'"
In excellent untouched never used condition. Beautiful color combination. Uncommon pattern. Couldn't ask for better in terms of finding a special 20th century quilt.